If you're using Streak on a team, chances are you've seen unified threads and asked yourself, why can't I respond in this thread? This looks different? What you're seeing is Streak's unified thread feature. 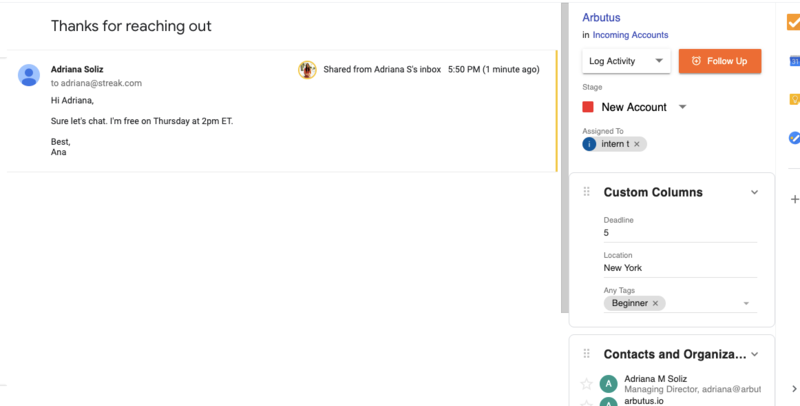 This feature shows emails in boxes that aren't currently in your inbox, but shared through someone on your team. How do I know if it's unified thread I'm seeing? A message is hidden from you and in order to view it, you need to Request Access from that message's owner. We'll take a closer look at one of the most common examples of unified thread, using some examples from the internal team here at Streak. Let's get started! Adriana receives an email from a prospective client. This email is considered external by Streak because it doesn't have anyone else from her domain on the email (@streak.com). Adriana decides to add the email to a box which is part of a Shared pipeline. Now an intern at Adriana's organization, Andrew, has notifications set to alert him when there's an update to boxes he follows. After navigating to the box, Andrew sees the new email thread. He clicks to open, but notices he cannot respond to the thread. This is because he's seeing a Streak unified thread.